The finch is a member of the passerine or “perching bird” group and is one of the most popular bird species with pet owners. Easy to care for, finches make excellent pets for first-time bird owners. Check your local pet store to get acquainted with the wide variety of exotic finches that’s available, including the striking purple finch, highly sought-after zebra finches and colorful Gouldian finches. Finches are found in many regions of the world, with their natural habitats varying from the arid deserts of Australia and the jungles of Africa to more temperate climates throughout the Northern Hemisphere. All variants of the finch species have developed 12 tail feathers and 9 primary feathers and are strong gliders. Size: Finches range considerably in size. The smallest is the Andean Siskin finch, which averages 3.8 inches from beak to tail. The largest is the collared grosbeak, which grows to about 9 inches in length. Most domestic finches that are kept as pets, including the zebra finch and Gouldian finches, are in the middle of this size range. Plumage: Feather coloring ranges considerably from variant to variant. Zebra finches display plumage ranging from black-breasted or orange-breasted with gray cheeks and vibrant cresting to recessive silver feathering and penguin-like patterns. Gouldian finches usually have solid-colored primary feathers that include a rich rainbow of hues. The purple finch is named for the dominant color of its plumage. Song/Chirp: Finches are songbirds. The song of a finch bird is cheerful, with warbling lasting several seconds. Males will sing longer in the presence of females. The song of a finch is normally punctuated with a descending note. It’s important not to cage finches with birds of other species, as they have unique dietary requirements and may suffer injuries from competitive infighting due to their small size. However, they are social animals, and thrive when caged with at least one other finch. 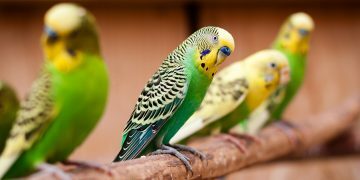 While they’re more resistant of direct human contact than species like the parakeet, they will show excitement through singing and fluttering when a favorite person enters the room. Feeding: Finches have active metabolisms and need to consume approximately 30 percent of their body weight in food each day. 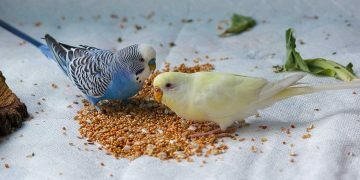 Limiting these birds to seed-only diets can cause illnesses, as they need proteins, vitamins and minerals that aren’t present in high enough quantities in basic seed formulations. Choose enriched seeds, or supplement regular feed with a mix of boiled eggs and crushed eggshells, along with vegetables and fruits. Grooming: Provide your pet with a bathing dish and trim its nails when necessary. Otherwise, these birds will look after their grooming needs on their own. 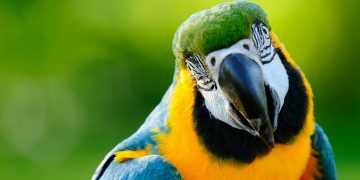 Health Concerns: The cages of all pet birds need to be kept clean of droppings to prevent sickness and infection. Cage disinfection should be performed at least once a month. These birds are also sensitive to the stress caused by loud noise and high activity levels around them, which can worsen any illnesses they may develop. Life Expectancy: Captive finches normally survive 5 to 15 years, though 6 years is an average lifespan. Look for stores that specialize in avian pets, which will offer a wider variety of finches for sale, including a broad selection of exotic finches that appeal to pet owners seeking unique and colorful birds. While the birds themselves are relatively inexpensive, costing between $10 and $40 for a pair, it’s important to budget for a proper cage that gives these birds enough room to stretch their wings. Expect to spend at least $50 to $100 on a bird cage and about $15 a month on feed, bird toys and accessories.